A Kryten Head from the episode Beyond a Joke. This prop comes from the scene where Kryten has slaved away cooking up lobster for Lister, only for Lister to then ask Kryten for some brown sauce. Shocked & disgusted by this, Krytens head then spectacularly explodes. Robert Llewllyn would wear a latex mask for day to day filming; but to achieve this scene, a wax head was made. In fact two wax heads were made. One was rigged with explosives, and then a duplicate backup made in case something went wrong with the take. 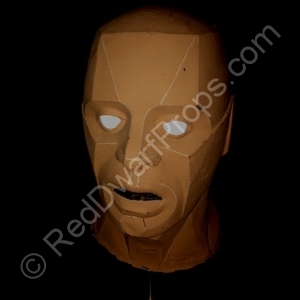 This Kryten head is of course the backup head, as the 1st take was good enough, and the head obliterated. I also have an original matching script written by Robert Llewllyn. The script itself is fascinating, covered with many hand written notes about the various scenes by one of the special effects production team. 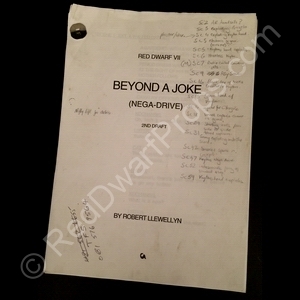 Tagged 1997, Beyond a Joke, Kryten, Robert Llewllyn, Script, Series VII. Bookmark the permalink. I am sure Lister asks for Ketchup, not Brown Sauce.